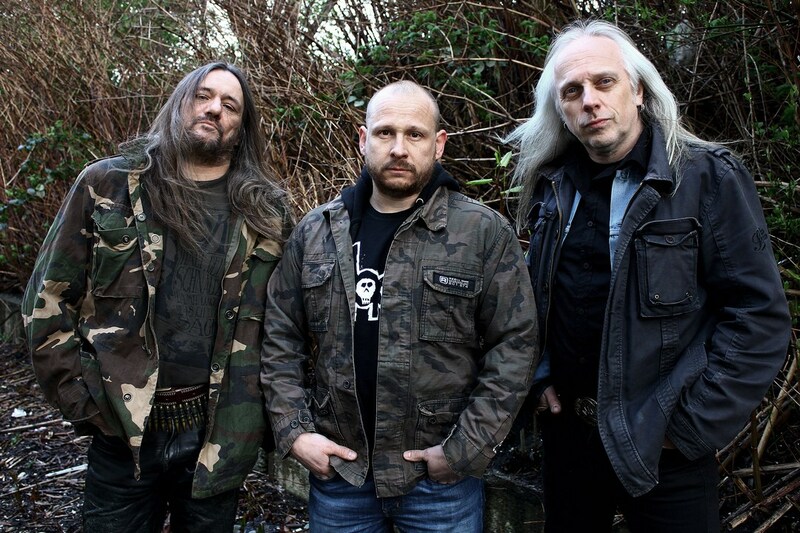 German thrash legends Sodom are back with a new album Decision Day. I caught up with frontman Tom Angelripper, who updates on the new record, tour plans, underrated Sodom albums, the U.S. presidential race and other topics. Chad Bowar: In the past‭ six‭ ‬years or so you have released numerous studio albums,‭ ‬EPs,‭ ‬splits and compilations.‭ ‬To what do you attribute the band’s current high level of productivity‭? Tom Angelripper: We still love what we do and we always try to find a creative way to write songs.‭ ‬When we finish an album production we start writing new songs after a short break.‭ ‬We are well attuned to each other since Makka (drums) joined the band.‭ ‬He brings so many positive influences to the band. Was there anything unique about the songwriting process for Decision Day‭? We worked the songs out without any pressure and we never talked about a release date with the label until the songs were written.‭ ‬That was a relaxed procedure.‭ ‬We recorded in different studios and rehearsal rooms.‭ ‬Each song was pre-produced and gave us the opportunity to change something if it was necessary. How did you decide on your Onkel Tom bandmate Corney Rambardt as the album producer‭? What are some of the lyrical topics you cover on Decision Day‭? Can music play a role in helping solve‭ ‬some of the issues facing the world today,‭ ‬or is it simply a diversion or escape‭? I am not politically active,‭ ‬but this music gave me the chance to enter the stage and scream it out.‭ ‬That is like therapy for me. What have been some of the highlights for you of your summer festival season‭? Every festival show was great.‭ We played at Obscene Extreme festival in the Czech Republic for the first time.‭ ‬That was awesome.‭ ‬Pure heavy metal.‭ ‬That was like‭ ‬travelling in a time machine‭ going back to the‭ ‘‬80s.‭ ‬We had a lot of fun. As a history buff,‭ ‬do you like to take the opportunity to visit historic sites,‭ ‬museums,‭ ‬etc.‭ ‬when you have extra time on tour‭? I never find time for cultural and historical adventures.‭ ‬That is a shame,‭ ‬but we just see airports,‭ ‬train stations and hotels and are always fighting with tight schedules. With‭ ‬2016‭ ‬being the‭ ‬30th anniversary of‭ ‬your full-length debut Obsessed By Cruelty,‭ ‬do you plan to do anything to commemorate the milestone‭? No.‭ ‬Maybe we’ll choose another song‭ ‬for the upcoming set lists.‭ ‬I‭ ‬am also fighting for a re-release here in‭ ‬Europe‭. We’ll see‭. When you formed Sodom in‭ ‬1982,‭ ‬could you have ever imagined the band would still be around nearly‭ ‬35‭ ‬years later‭? When we started the‭ ‬band we had no idea that we would still‭ be ‬alive‭ ‬after‭ ‬35‭ ‬years.‭ ‬In the beginning our musical attitudes were just for fun.‭ ‬But we got our first deal in‭ ‘‬84.‭ ‬That was amazing, ‬working in a professional studio for the first time.‭ ‬We were so lucky‭ ‬that Steamhammer believed in us.‭ ‬But being alive after so many years is a result of hard working men and the loyal support of our fans. The music industry is completely different today than when you started.‭ ‬What have you had to change and adjust on the business side of things over the years to stay afloat as a band‭? Looking back at your catalog,‭ ‬is there an album that you think was overlooked or underrated when released,‭ ‬but still holds up very well‭? Vinyl has made a big comeback,‭ ‬and your new album is being released in that format as well.‭ ‬Are you a vinyl collector at all‭? What is your perspective on America’s presidential race between Donald Trump and Hillary Clinton‭? Hope that Hillary will make it.‭ ‬My personal democratic attitude will‭ ‬never‭ ‬accept Trump as a president‭.